Tips to Building the Perfect High Performance Grip (Handgun) | Firearms, Edged Weapons, Fighting Fitness and More! I have come to the conclusion that most shooters can improve their ability to shoot faster (and better) simply by improving their grip on their handgun. I have discussed this in my book, but thought I would share the information once again (as well as a great video to watch) below. So how do we obtain that level of control on a handgun? Simple, pay attention to the principles that actually cause recoil and then work on minimizing it with proper friction and leverage. High Performance Grip – Based on fundamental laws of friction and leverage. 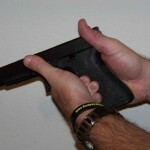 The grip can be defined method used to hold the gun with both hands and create “positive, neutral control.” Portions of this post are taken from YDHTP (book). The gun hand should grip high on the back strap directly underneath the tang of the weapon giving the advantage of having more leverage against the weapon. 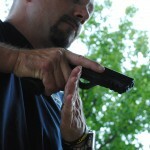 Drive the hand up hard and high on the backstap of the gun during the draw process. placing it there, but instead driving the gun hand high up on the grip during the draw process. The web of the gun hand should be almost pinched by the backstrap area of the gun. The gun hand should be positioned to allow the shooter to press the trigger straight to the rear during trigger manipulation. Different individuals will position their trigger fingers on the trigger in a different location due to hand size, size of the handgun, etc. The principle to remember is to place the finger on the trigger in a position that will allow the trigger to be pressed directly to the rear. The support hand is positioned so that it is pressed firmly against the exposed portion of the grip not covered by the gun hand. This requires one to flag the strong hand thumb allowing the support hand to completely engage that part of the grip. All four fingers of the support hand should be under the trigger guard with the index finger pressed hard underneath the trigger guard. The support hand should also be as high as possible with the thumb pointing forward toward the threat roughly below where the slide meets the frame. There should be a distinct fit, like the fitting together of two puzzle pieces with the gun and support hand. The combination of having both hands high on the weapon and applying force to all available gripping surfaces, allows the advantages of friction and leverage to control the weapon. Grip pressure should be equal or slightly greater with the support hand, allowing the gun hand to remain more relaxed for smooth quick operation of the trigger. Locking the wrist tendons is a critical component of controlling recoil. Failure to lock the tendons will result in the gun “bouncing” above and below the line of sight (kind of like the movement a dolphin makes when they swim). Lock the wrist tendons in both wrists to maximize recoil control. Applying pressure on the rear (backstrap) of the grip will be the most effective way to control recoil, and this area should receive as much pressure as possible from the heels of the hands. I focus on applying pressure to the left rear part of the grip with my support hand. Another way to practice this is to imagine that your fingers on the strong and support hand are glued together in you final grip, and that the fingers of your support hand can not slide. Now think about squeezing your palms together increasing the pressure on the back of the gun as you extend it toward the target. Flagging the strong hand grip allows you to keep the portion of the grip panel where pressure is critical exposed for the support hand. Notice how the strong hand thumb is flagged on the picture left, this allows the grip panel to be exposed enough at the rear so I can drive my left hand palm into it and attempt to apply pressure on the back part of the grip. 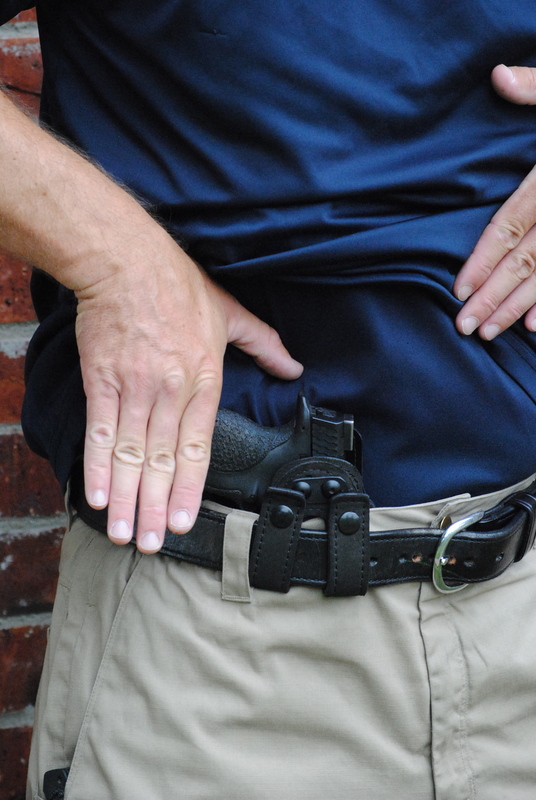 The “judi chop” position, where the support hand drives up under (hard) the trigger guard is a key area for pressure that minimizes the downward movement of the gun by the other hand. guard and the strong hand fingers. This is a consistent stopping point for the support hand and will ensure a consistent grip is formed. 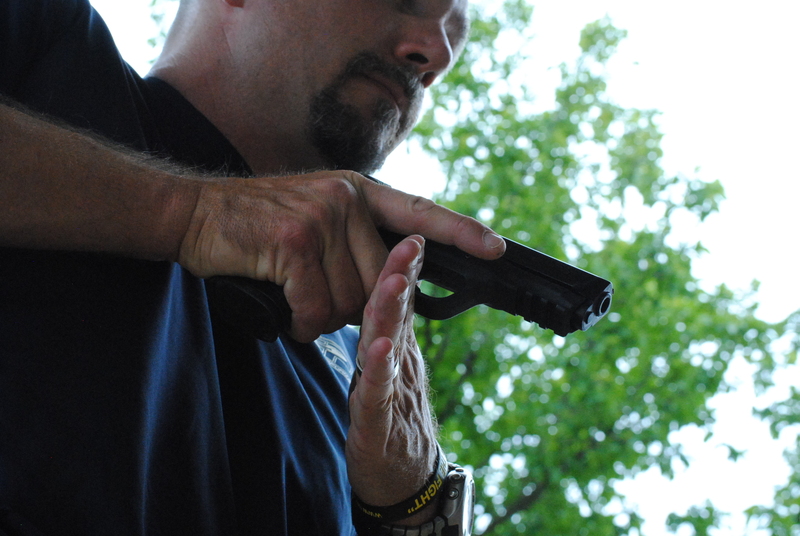 Aggressively pursue a combination of technique improvement and strengthening excersises to improve your recoil control with a handgun. Tagged handgun grip, mike seeklander, proper grip, shoot better. Bookmark the permalink. The “judi chop” is something I just never thought of, it works great! Question-who makes your IWB? Thanks for reading, and the comments! 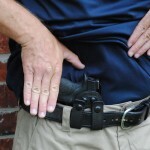 Safariland makes the model 18 holster that I use. Such an informative and helpful post! I’m going to apply some of your techniques and tips to my shooting the next time I head out to the range. Thanks for sharing! Thanks for sharing your nice blog. It is really a helpful blog post. I will apply your tips in my work. Very great and knowledgeable post. Just wanted to know how important is it to get the support hand on the pistol grip. I have big hands and there is little to no room to get my support hand on the pistol and keep it there. I often find that after a couple of shots, I’m gripping the fingers on my strong hand. Am i gripping too hard with my support hand? Is there such a thing as a gun grip too small or am I needlessly concerned? Do I need to adjust my grip on my strong hand to accomodate getting my support hand on the pistol? Shooting a “pre adjustable backstrap” XD. Any comments appreciated! Hey Kevin- Your support hand is very important, but individual hand sizes and handgun grip sizes will make it more difficult for a bigger handed individual. Consider “flagging” the thumb when you build the grip, which will allow the thumb muscle to relax and then you can get more of your support hand on the grip (specifically the rear/side area. 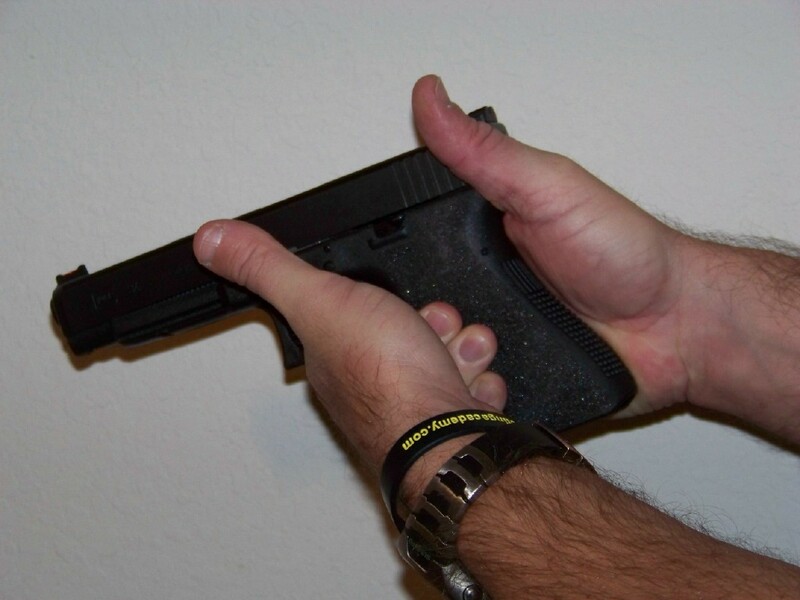 Its perfectly ok to grip on your strong hand fingers as well though, I find myself locking up the grip on the back left portion of the handgun stock (grip) and also on my strong hand fingers. Also, use the biggest grip strap possible and see if that helps! I moved from revolver to my first auto as an HK-P9, very high grip and very low barrel axis. When i was finally able to acquire a 1911 (hey, they were hard to get back in those days!) I would occassionally position the strong hand too high – and fail to disengage the grip safety. So i pinned it. Never really liked doing so, but grip safeties with the rIsed area just fit the hollow below my thumb. That 1911 was stole , alas. But I was able to score a then brand new Para wide body. The fingers on my strong hand wrapped around the wide grip and didn’t fully flatten out on the left side of the gun. My weak hand would loosen tbe stronghand finger contact! So i built up the grip using epoxy, in exactly the area where the left (weakhnd) thumb contacts the grip. Ichiro Nagata dix the same on his revolver. The raised area allowed even grip pressure with the weak hand. Helped greatly with my large but stubby hands. Bottomline: Mike’s grip is superb. Getting your individual fingers to fit the generic grip can take some effort! And yes, those 18-20″ bicepts probably are a great accessory! Just not listed in Brownells!